The island of Bora Bora is small, only 6 miles long and 2 ½ miles wide, but as they say “Good things come in small packages”. This island paradise is overflowing with breathtaking beauty. Today Bora Bora is the sight of exquisite luxurious resorts, sunny skies, warm waters and friendly locals. As you might have already guessed, the main industry on this gorgeous island, in French Polynesia, and its collection of tiny motu (small surrounding islands) is tourism. Ever since 1946, French Polynesia (a collection of islands that Bora Bora belongs to) has been an overseas territory of France, although the territories are afforded a lot of autonomy in regards to everything from their currency to taxation. The climate remains warm all year round on the island paradise, but the best time to visit Bora Bora is from November to April. This time of the year offers excellent weather, with temperatures in the mid-70s to mid-80s. 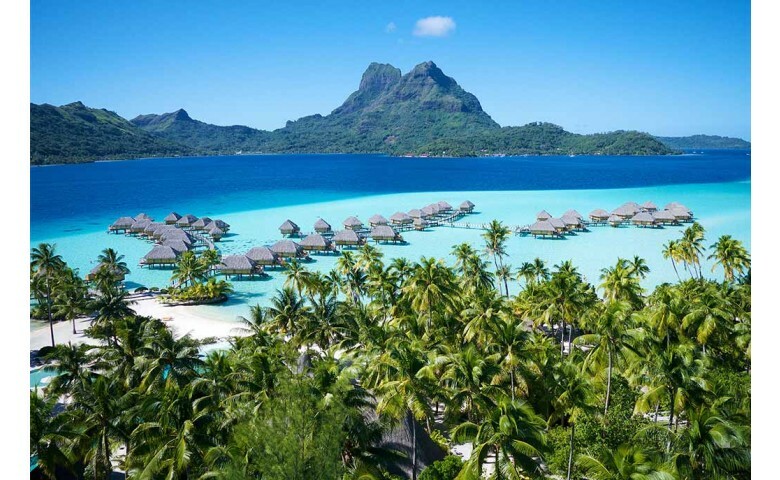 However, the main tourism season for Bora Bora is from May to October, when the rain showers are isolated and the number of tourists increase. From December to March, the weather is wet and visitors become meals for the mosquitos. The main activity on this luxurious island is just that, relaxation and luxury and there are numerous ways to achieve this. You can bike, at your own pace, around the island, taking in the magnificent scenery. You check out the underwater life at the Bora Bora Lagoonarium and the coral Gardens, or even retire to the deck of your signature overwater bungalow. If you want to soak up the local culture, you can head over to Vaitape. Vaitape is the largest city on Bora Bora, with about half of the the island’s population living there. There you will find restaurants, boutiques and even the medical center. Make no mistake, vacationing on Bora Bora is very expensive and there are some expensive boutiques in Vaitape, mainly Sibani Perle. One of the main souvenirs to buy at Sibani Perle are their black pearl jewelry. Travelers rave about the pieces they find there, mainly because of the quality and authenticity of the pearls contained in the jewelry. If it’s dinner you are thinking of, Vaitape has several amazing eateries that serve up some of the freshest seafood out of the water. If you want a romantic dinner with that special someone, book a table at the Bora Bora Yacht Club, and enjoy oceanside dining at its best. Bora Bora is an amazing travel destination that shows just how beautiful paradise can be.